To tell at the 165th Highland Games of the St. Andrew's Society of Detroit, this is a bit earlier than my usual posting time. North Oakland County Storytellers once again will tell in the Wee Bairns area. I plan to tell this story among others. 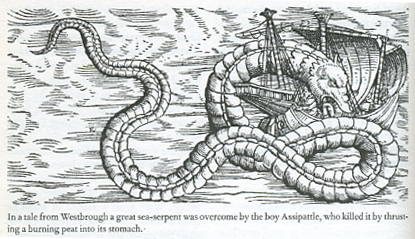 It's a favorite of mine with a monster sea serpent (positively dragonlike! 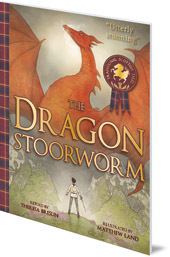 -- some call it a Scandinavian dragon), a princess, a feisty hero, magical items, and a lot of humor. 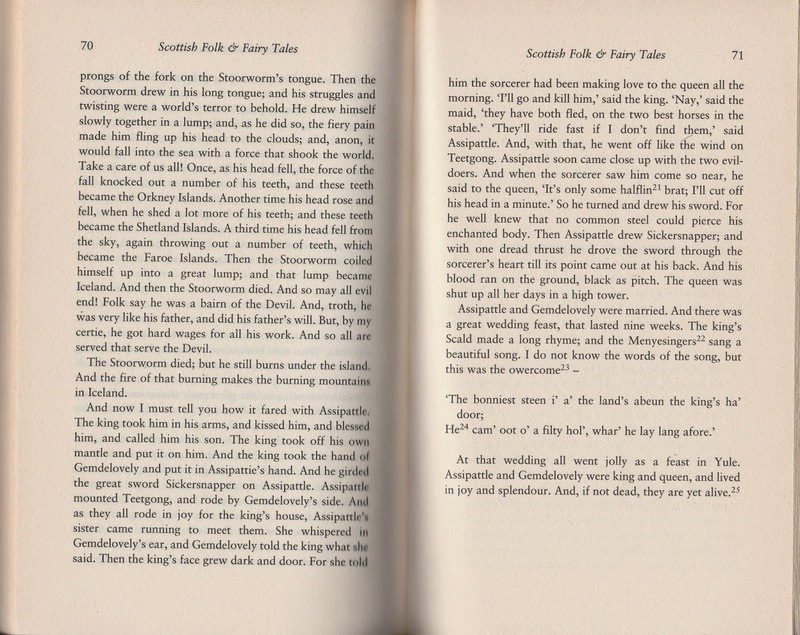 The story in its Public Domain format from the classic text by Sir George Douglas is longer than a briefer version you might check, Virginia Haviland's Favorite Fairy Tales Told in Scotland, but it's good to find as much as possible when developing a story. Something I never thought about was the hero's name, Assipattle. I incorrectly believed my audience heard the explanation about his name. That first part of it, for example, has to do with Ashes just like variants of Cinderella and there are many points where he is a "Cinderfella." My husband and wonderful roadie, Tom, noticed parents uncomfortable with the name throughout the story. They apparently thought it was a name about "paddling" a part of his anatomy! 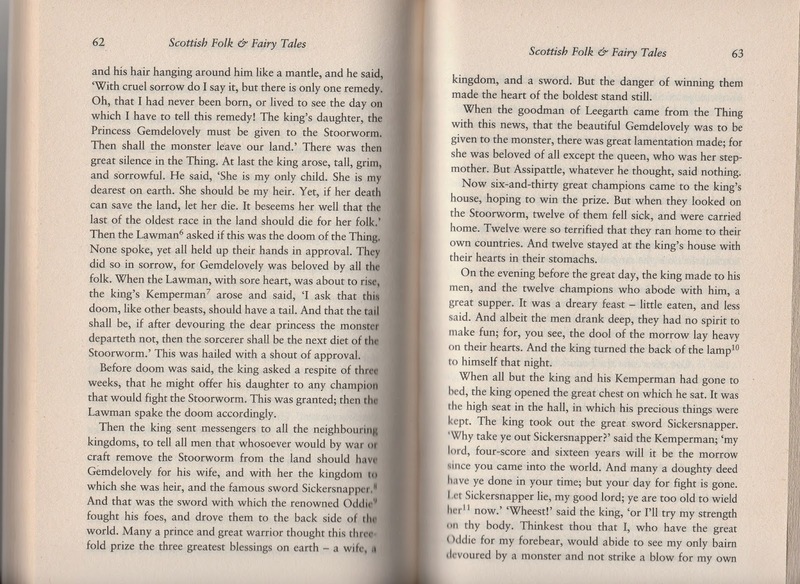 For that reason after the story I include here the notes about the tale. That brief article is the only comment on any story Douglas gives other than some brief footnotes and his thorough introduction to the book. 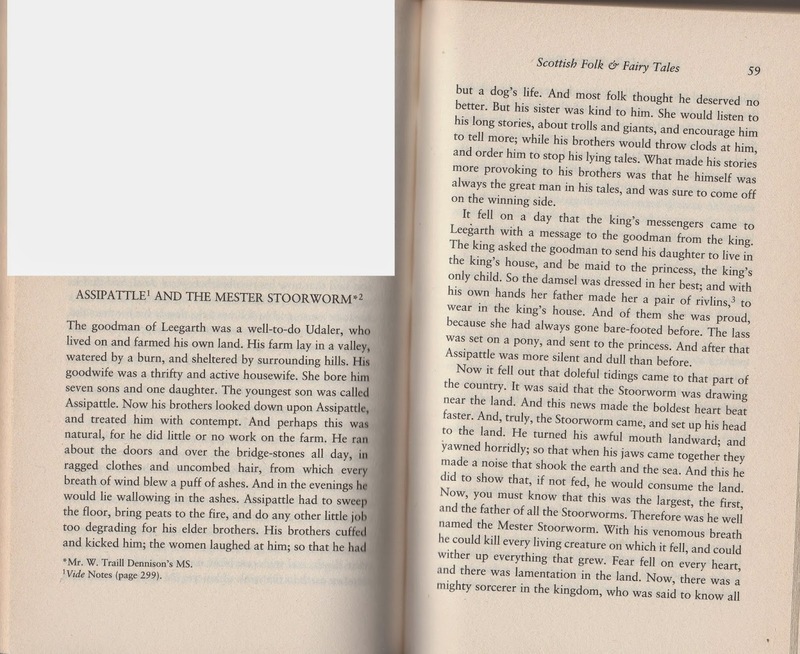 The book is online in various versions, but some omit a large part of the book. The Gutenberg online edition is one of those. Thank heavens for Hathitrust.org and the Indiana University edition. 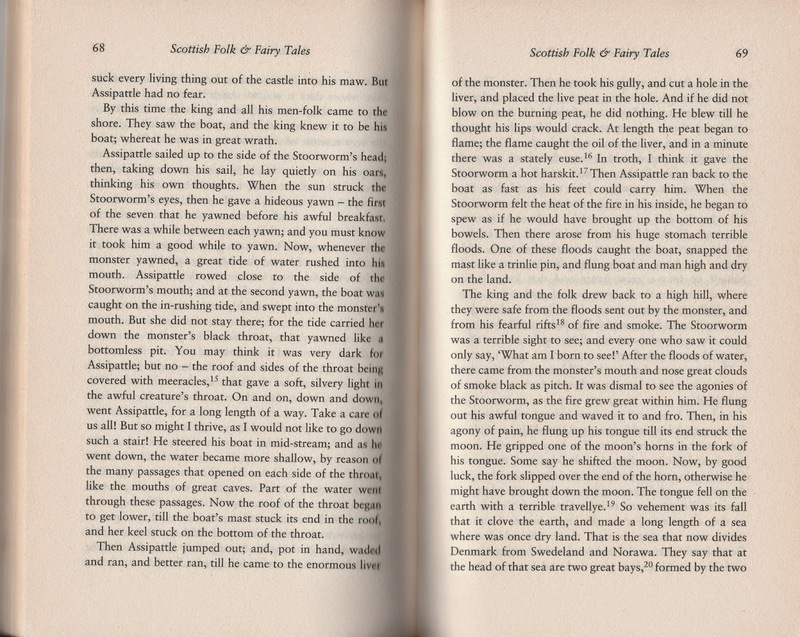 Their copy is presumed to be from 1901 and is called Scottish Fairy and Folk Tales. 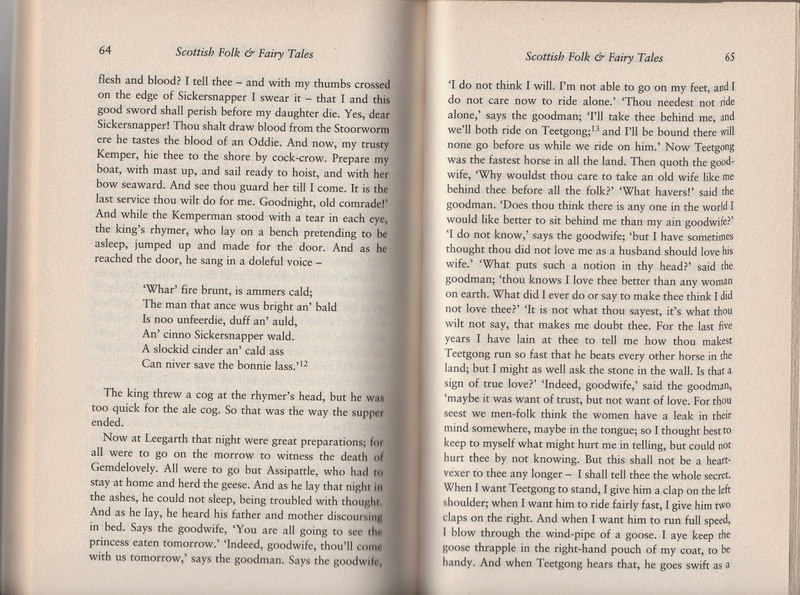 My own copy is a reprint of the 1892 edition and is called Scottish Folk & Fairy Tales. The sections some editions miss include this tale from the "Giants and Monsters" section. In case you doubt the story's popularity, search Google for Assipattle and the mester stoorworm. 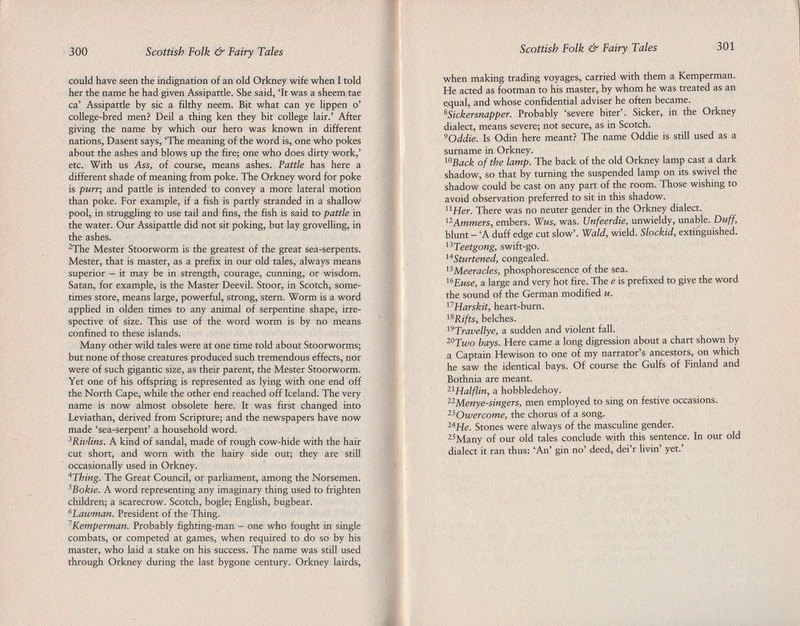 Even a one-act play, lyrics, a slightly retold version by Elizabeth W. Grierson, and much more can be found because this tale from the Scottish Orkney Islands became popular throughout Scotland. 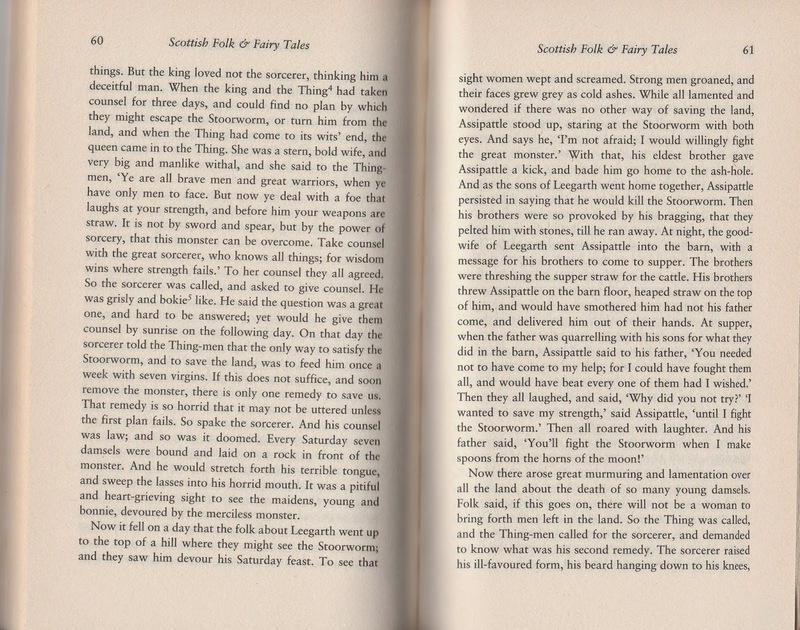 Is it any wonder I prefer to use the translation of the horse's name as Swift-Go to the original of Teet-Gong after the reaction to Assipattle's name? 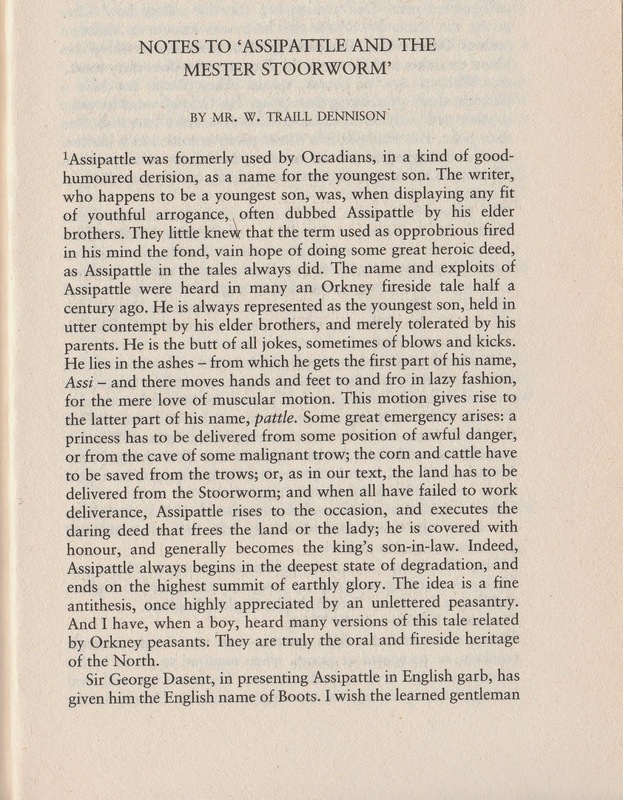 Sir Douglas's notes explain a bit more including his own identification as Assipattle. Notice the book refers to him as a dragon. Next week will look at another program I do, the One-Room Schoolteacher.